All the buttons are placed on the top, and from here you can control media playback, adjust the volume, answer a phone call, or trigger your phone’s voice assistant. The EXTRA BASS button engages the device's dual passive radiators for more bass, and the same button can also be used for enabling or disabling the lights. 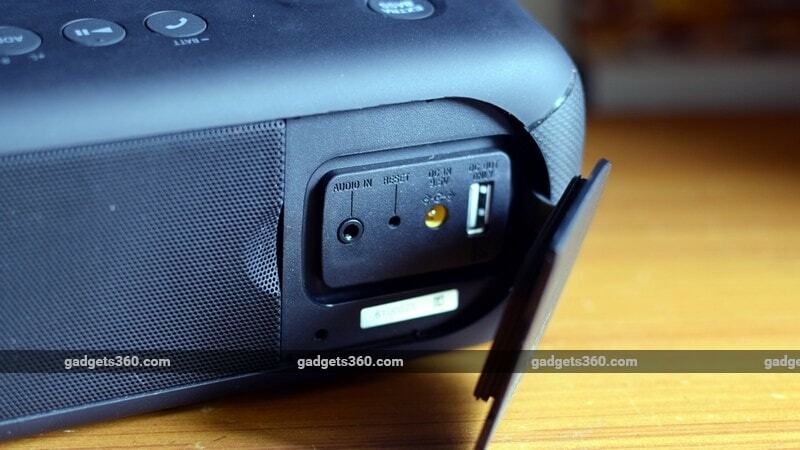 The power button also lets you pair the speaker with your Bluetooth device, in case you it doesn't support NFC. The XB40 can work with up to three simultaneous connections. In the front, there’s a metal mesh grille protecting the drivers. We have two full-range 61mm drivers for stereo sound, and a passive radiator facing forwards. The second radiator is placed at the back, and can be seen through a similar metal mesh. The SRS-XB40 has three types of lighting - an RGB line that runs along the edges of the mesh grille, speaker lights, and a strobe for each driver. The pattern of the lights can be controlled via the Sony Music Centre app. The SRS-XB40 supports Bluetooth 4.2 and streaming codecs such as SBC, AAC and LDAC. The latter is Sony’s proprietary high-resolution codec, similar to Qualcomm’s aptX HD. You’ll need a compatible Xperia device but it's also now baked into Android Oreo so compatibility will become wider. 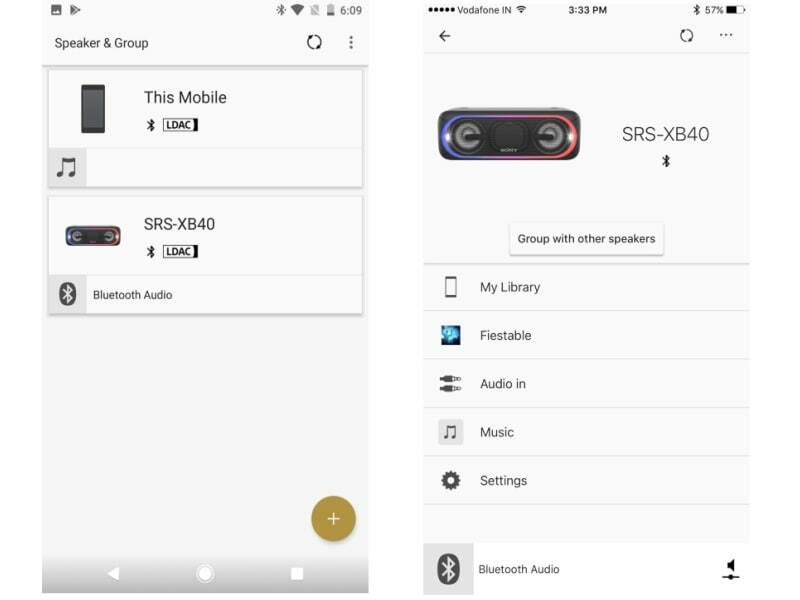 When connected to a LDAC capable phone such as the Google Pixel, the SRS-XB40 automatically uses the best available codec. The drivers can handle a frequency range of 20Hz to 20,000Hz. Sony's Music Center app adds more features and functionality to the speaker. The Android app isn’t very well designed but it’s functional. It is missing one critical feature, which is a display of speaker's battery status. The iOS app is slightly better designed. On the main screen of the app, you can pair more of Sony's EXTRA BASS speakers (up to 10), switch to the auxiliary input, or play songs that are on your device. You can also adjust the volume of the speaker, which is independent of your device's volume level. Battery life is rated at 24 hours and while we couldn't test that out in one go, the speaker easily lasted us about a week, with an average of 2-3 hours of music being played each day, which is very good. When the battery is low, the volume level is restricted to about 20 percent and you keep getting a prompt to charge the device if you try to increase the volume. Charging the battery to its full capacity takes about 4 hours. The Sony SRS-XB40 offers powerful sound for the price, and if you look online, you can find it selling for as little as Rs. 13,340. It isn’t as compact as most portable speakers, but given the volume output, size of the drivers and battery life, it seems as through there is a specific market for it. The speaker handles most genres of music quite well and it’s nice to see that it’s water resistant. However, the DJ features feel a bit gimmicky. Overall, if you’re looking for a powerful Bluetooth speaker with good battery life, then the Sony SRS-XB40 is a good choice. 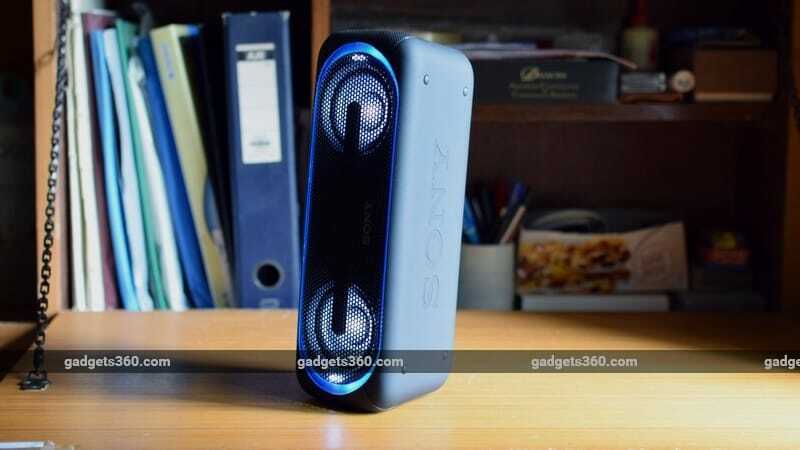 product The Sony SRS-XB40 is a bulky Bluetooth speaker that belts out powerful sound and boasts of very good battery life.